1. PINK & PURPLE & BLUE…OH MY! Looking to tap the trend? Head to your colorist and don’t try to DIY; lifting and adding a color is a job for a professional to ensure the best results with the least amount of damage. Wave buh-bye to super-contrasty ombré that has you looking like you’re overdue for a root touchup. According to colorist Marco Pelusi of Marco Pelusi Hair Studio in West Hollywood, CA, the trend is showing its softer side this season via a subtler dark-to-light gradient. Why we love it: It’s fun and fashion-forward, but this version is appropriate for women of all ages and professions. Spring into the new season! For a whimsical touch, top off your tresses with a delicate floral accessory, similar to the styles seen on the Zac Posen catwalk. Try: L. Erickson Giverny Rose Comb; $58, Franceluxe. 4. BB CREAM…FOR YOUR HAIR! Beauty balm, which in the past few years has become every woman’s “must have’ skincare product, has now made a name for itself in the hair world. This multi-tasker is packed with rich nutrients and anti-aging essentials that nourish, hydrate, repair and improve the overall condition of your hair, similar to the way a BB cream enhances your skin. Try: Mineral Fusion Beauty Balms for Hair; $12.99 mineralfusion.com and Whole Foods. Sharply angled styles that are longer in front, like this lob, boast just the right amount of edginess. Pluss they’re great for framing a full face and creating the illusion of high cheekbones. At first, fashion hubs like NYC and LA monopolized the blow-dry bar (no cuts and no color­­—just wash and style) trend. But now, the rest of the country )and world) are catching wind. 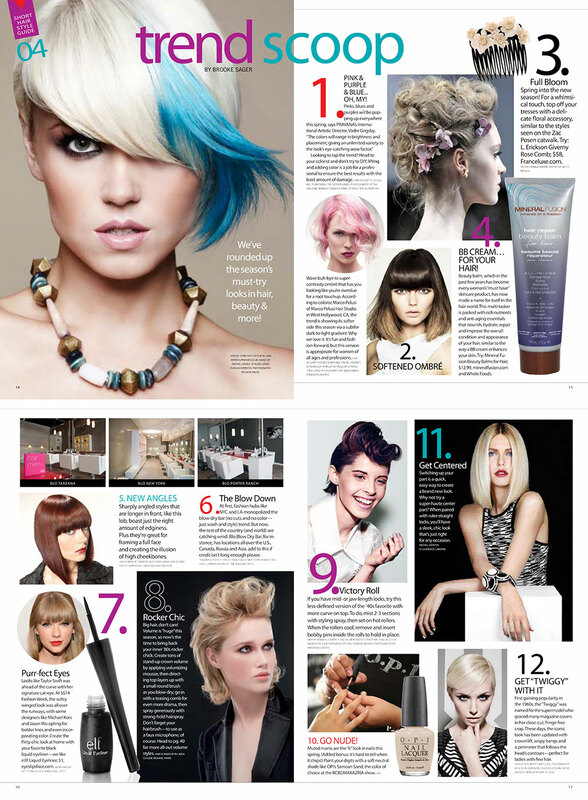 Blo Blow Dry Bar, for instance, has locations all over the U.S., Canada, Russia and Asia. If you have mid- or jaw-length locks, try this less-defined version of the ‘40s favorite with more curve on top. To do, mist 2-3 sections with styling spray, then set on hot rollers. When the rollers cool, remove and insert bobby pins inside the rolls to hold in place. Muted manies are the ”it” look in nails this spring. (Added bonus: it’s hard to tell when it chips!) Paint your digits with a soft neutral shade like OPI’s Samoan Sand, the color of choice at the BCBGMAXAZRIA show. Switching up your part is a quick easy way to create a brand new look. Why not try a super-haute center part? When paired with ruler-straight locks, you’ll have a sleek, chic look that’s just right for any occasion. First gaining popularity in the 1960s, the “Twiggy” was named for the supermodel who graced many magazine covers in her close-cut, fringe-free crop. These days, the iconic look has been updated with crown lift, wispy bangs and a perimeter that follows the dead’s contours—perfect for ladies with fine hair.